Geochemical services refer to the study of origin, evolution, and distribution of chemical elements on earth that are contained in rock-forming minerals and products derived from these elements. Geochemical services for the mining industry consist of collection of samples, chemical analysis of samples, and interpretation of analytical results. The testing is carried out in dedicated geochemical laboratory or directly on-field. Experienced and skilled geochemists are needed to carry out laboratory based or in-field based analysis. Different types of geochemical services include sample preparation, aqua regia digest, mixed acid digest, X-ray fluorescence, hydrogeochemistry, and fire assay. Geochemical analysis can be used to predict where petroleum, metals, water, and commercially valuable minerals may be located. It can also be used to predict or trace leaks from waste disposal sites and track and understand fluctuations in Earth’s climate. The cycle of mining begins with exploration, continues through production, and ends with closure and post-mining land use. Geochemical analysis plays a major role in selection of the mining site, as the test analysis report interprets deposition and mineral content. Expenditure on mining and exploration processes has increased over the last few years, due to the rise in demand for various types of minerals and metals. Industries engaged in mining are processing, analyzing, and interpreting remote sensing, landsat, and geophysical datasets along with geochemical data to determine potential mining sites in order to begin with the exploration and mining process. Geochemical services can be carried out in laboratory or in-field based laboratories. In-field based testing is carried out in a portable laboratory directly on the site. This facilitates quick decision making. Growth in the mining sector is projected to drive the geochemical services market during the forecast period. The mining industry is one of the largest consumers of geochemical services. Thus, increase in demand for metals, ores, and minerals is expected to augment the geochemical services market for mineral & mining industry in the near future. The mining industry is one of the major sources of pollution. Therefore, strict environmental regulations have been imposed on mining and related activities. Waste generated from mining companies consists of toxic elements that cannot be discharged directly into the environment. Hence, environmental authorities have imposed stringent laws and regulations on the industry regarding waste management. In order to meet these regulations, mining companies need to install complex wastewater treatment plants that are energy intensive and entail high operating costs. Water treatment systems are uneconomical, due to the high capital investments and operating costs. Thus, implementation of stringent environmental norms is estimated to hamper the global geochemical services market for mineral & mining Industry in the near future. Geochemical services have become an integral part of mining operations, as they are used across the mining lifecycle. These services not only help in identifying potential elements, but also make the extraction and processing of ores more efficient and effective. Advancements in technology have enabled service providers to establish labs at mining sites. These offer quick and accurate results at the site itself, saving time and capital investment significantly. Application of technologies in excavation and processing stages is helping in grade control and high recovery of valuable metals or minerals, without the extraction of penalty minerals. Technological advancements in geochemical services and technology are expected to make the mining process more efficient and effective and enable mining of valuable minerals without causing much harm to the environment. Based on region, the global geochemical services market for mineral & mining industry has been divided into North America, Latin America, Europe, Asia Pacific, and Middle East & Africa. Asia Pacific dominated the global market in 2017. This can be primarily ascribed to the rise in demand for metals and ores in the region. Asia Pacific is also region an industrial hub. The market in the region is likely to expand at a significant pace during the forecast period, primarily due to the increase in demand for minerals and metals, especially in developing countries such as China and India. Key players operating in the global geochemical services market for mineral & mining industry are Bureau Veritas SA, Intertek Group plc, SGS SA, ALS Limited, Shiva Analyticals & Testing Laboratories India, Geochemic Ltd., Activation Laboratories Ltd., ACZ Laboratories, Inc., Alex Stewart International, and AGAT Laboratories Ltd.
Geochemical services refer to the study of origin, evolution, and distribution of chemical elements on earth that are contained in rock-forming minerals and products derived from these elements. Geochemical services for the mining industry consist of collection of samples, chemical analysis of samples, and interpretation of analytical results. Increase in demand for metals and minerals is expected to be a major factor driving the geochemical services market for mineral & mining industry during the forecast period. This report analyzes and forecasts the geochemical services market for mineral & mining industry at the global and regional levels. The market has been forecast based on value (US$ Mn) from 2018 to 2026, considering 2017 as the base year. The study includes drivers and restraints of the global geochemical services market for mineral & mining industry. It also covers anticipated impact of these drivers and restraints on the demand for geochemical services during the forecast period. The report also highlights opportunities for the geochemical services market for mineral & mining industry at the global and regional levels. The report includes detailed value chain analysis, which provides a comprehensive view of the global geochemical services market for mineral & mining industry. Porter’s Five Forces model for the geochemical services market for mineral & mining industry has also been included to help understand the competition landscape of the market. The study encompasses market attractiveness analysis, wherein application segment have been benchmarked based on their size, growth rate, and general attractiveness. 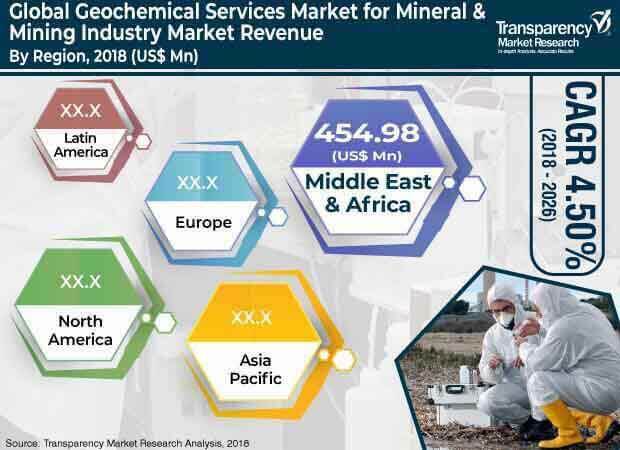 The study provides a decisive view of the global geochemical services market for mineral & mining industry by segmenting it in terms of service and type. In terms of service, the market has been classified into sample preparation, aqua regia digest, mixed acid digest, X-ray fluorescence, hydrogeochemistry, fire assay, and others (including carbon and sulfur analysis and mobile metal ion analysis). In terms of type, the market has been bifurcated into laboratory based and in-field based. Service and type segments have been analyzed based on the present and future trends. Regional segmentation includes the current and forecast demand for geochemical services in North America, Europe, Asia Pacific, Latin America, and Middle East & Africa. The report provides size (in terms of value) of the global geochemical services market for mineral & mining industry for the base year 2017 and the forecast between 2018 and 2026. The market value has been defined in US$ Mn. Market numbers have been estimated based on service and type segments of the geochemical services market for mineral & mining industry. Size of the global, regional, and country-level market has been provided. The report comprises profiles of major companies operating in the global geochemical services market for mineral & mining industry. Key players operating in the global geochemical services market for mineral & mining industry are Bureau Veritas SA, Intertek Group plc, SGS SA, ALS Limited, Shiva Analyticals & Testing Laboratories India, Geochemic Ltd., Activation Laboratories Ltd., ACZ Laboratories, Inc., Alex Stewart International, and AGAT Laboratories Ltd. Market players have been profiled in terms of attributes such as company overview, financial overview, business strategies, regional presence, and recent developments.